﻿Surgeons removing a malignant brain tumor don't want to leave cancerous material behind. But they're also trying to protect healthy brain matter and minimize neurological harm. Once they open up a patient's skull, there's no time to send tissue samples to a pathology lab - where they are typically frozen, sliced, stained, mounted on slides and investigated under a bulky microscope - to definitively distinguish between cancerous and normal brain cells. 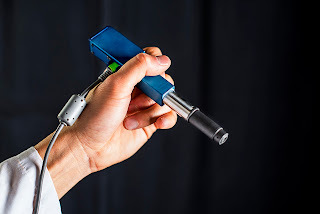 The new technology, developed in collaboration with Memorial Sloan Kettering Cancer Center, Stanford University and the Barrow Neurological Institute, is outlined in a paper published in the journal Biomedical Optics Express. The microscope also employs a technique called line scanning to speed up the image-collection process. It uses micro-electrical-mechanical - also known as MEMS - mirrors to direct an optical beam which scans the tissue, line by line, and quickly builds an image. In the paper, the researchers demonstrate that the miniature microscope has sufficient resolution to see subcellular details. Images taken of mouse tissues compare well with those produced from a multi-day process at a clinical pathology lab - the gold standard for identifying cancerous cells in tissues. Based on article originally posted by University of Washington.